Great question, Katie. 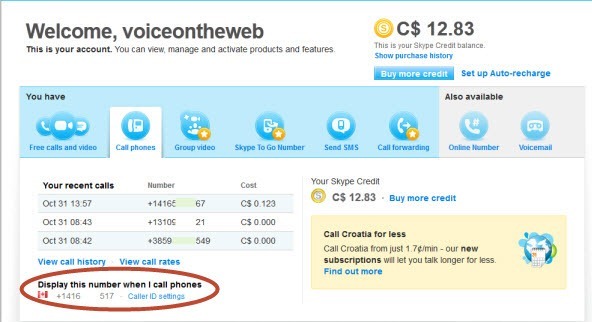 Several years ago Skype introduced the ability to select between your Skype Online number and a mobile phone number to show up as your callerID on SkypeOut calls. But over time, details such as this, tend to get lost amongst all the various calling and converstion features available on Skype. From the Skype’s Home Page, sign into your Skype Account (upper right) using your Skype login information. Any Skype Online number to which you have subscribed. At this point, if you have not previously set up your mobile number for callerID, you will be asked to go through a verification process that involves sending a verification code via SMS to the selected mobile phone number. Enter that verification code back into the callerID page from which you requested it and you’re set up. At this point when you make SkypeOut calls, whether using Skype Credit or a Skype Calling Plan, your mobile number will show up as your callerID at the called party’s phone (unless they have deployed some form of calleriD blocking).